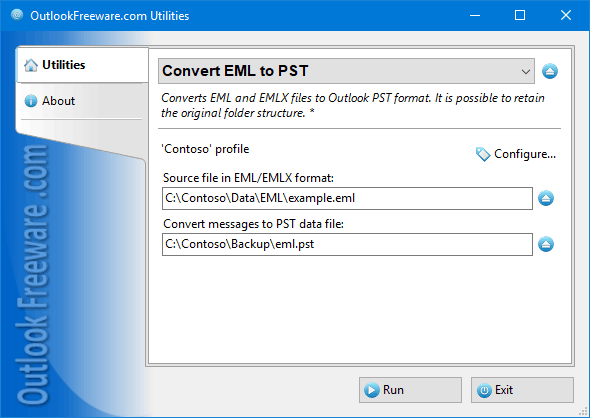 This free utility converts email message files from EML to PST format for Outlook. From a large number of EML files in different folders, one or more PST files are being created, depending on the settings of the utility. This free utility converts email message files from EML to PST format for Outlook. From a large number of EML files in different folders, one or more PST files are being created, depending on the settings of the utility. For example, when converting EML messages, the utility can immediately split the resulting PST files by size or by year. Messages in EML and EMLX formats are used by different email clients like Live Mail, Mozilla Thunderbird. Power Email Harvester can search bulk email address from mail server. The program is so simple to use. It can be mastered in 5 minutes. Backup Outlook, Outlook Express, Eudora, IncrediMail, The Bat! mail folders, address books, filters and user settings. In addition, Internet Explorer custom settings and favorites are also backed up. SysOZ OST to PST Converter is successfully completed recover & export password protected OST file with migrate OST email into working PST format without pay any of cost and try Free OST to PST tool. LiteMail 4.0 is an industrial strength bulk email marketing software. It is powerful enough to create and send the most complex business emails, as well as easy to use so you won't find it hard to send simple notifications to your mailing list.